Quickfire Review: Cold In July (2014) – Hooray For Movies!! Based on Joe Lansdale’s novel of the same name, Cold In July is an average exploitation-thriller elevated by an excellent trio of performances from it’s central male leads. Set in 1989 deep Texas, it starts as a cat and mouse thriller after timid family man Richard Dane (a wonderfully mulleted and mustachioed Michael C Hall) begrudgingly shoots dead a burglar in his secluded home. As he struggles to come to terms with the taking of a young man’s life, he becomes aware that the boy’s father Russel (Sam Shepperd), a dangerous ex-con, is openly seeking his revenge. The first 30 or so minutes are well played, tense and is at it’s best when taking the time to explore the Dane family try and move on with their lives, all leading up to a rain soaked showdown between the town’s officers and Russel. 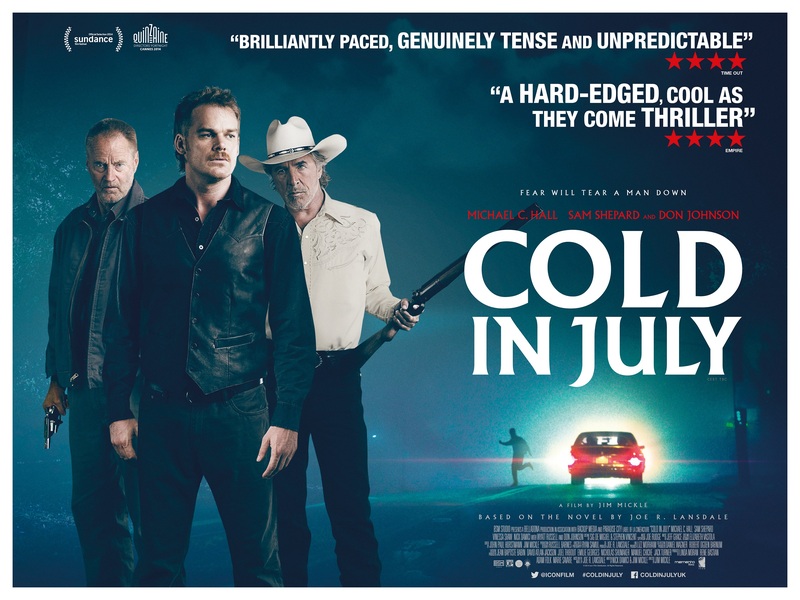 Cold In July then takes a left turn as Dane stumbles upon some clues that suggest the boy he shot wasn’t Rusell’s son after all and the two men join forces to uncover the truth and seek out his real son, aided by Private Investigator and all round cool old Texas dude Jim Bob (Don Johnson). The next hour then hits all of the standard revenge thriller milestones as the trio uncover all sorts of nasty secrets on their path to righting some wrongs. While it remains entertaining through to it’s conclusion, as the credits roll there is a sense that there was a more interesting story in the first 30 minutes than the last 60. It is ultimately raised above the ordinary by the performances of Hall, Johnson and Shepperd who enjoy a natural and at times understandably tense chemistry. The cast totally made this worth watching. Everything else about it was a tad bit messy. Good review.